Develop and implement a watershed scale volunteer monitoring program, documenting long-term trends in watershed condition that cumulatively result from restoration activities, land management changes, and natural processes. Involve student and community volunteers in monitoring efforts to encourage stewardship and foster an understanding of the complexities of natural resource protection. Build on prior monitoring efforts to facilitate data sharing and improve data analysis. 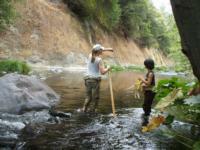 Volunteers provide a snapshot of the health of Big Chico Creek by collecting data at ten different sites during each event. Each team typically monitors one or two of the sites per event. The project website also includes information about the watershed, wildlife and reasons for monitoring. Reports produced using Stream Team data are accessible on the project website.